Why are we here and what do we do? 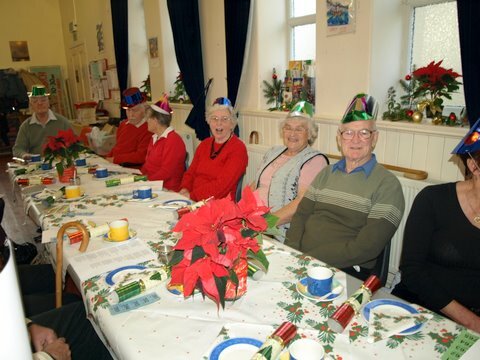 Party time at Abergele Stroke Club - again! Illnesses that result in physical difficulties present challenges to be overcome. For stroke survivors, help and support is at hand from the first contact with health and social care professionals, who will have been involved with the introduction of a programme of rehabilitation, that involves the patient, relatives and carers right through to the opportunity to come to a Club such as ours. Many stroke survivors value the on-going support and encouragement that is available at the Club, where volunteers are committed to enabling members be as independent as possible through the provision of a range of activities that are interesting and stimulating. Members (and their carers if attending too) are able to offer one another mutual support, often sharing solutions to issues that have been encountered along the way. So, what do we do? Well, it's not flying around in helicopters at every meeting, but our volunteers regularly get in a spin! We have an excellent venue in Pensarn, provides a state of the art setting for members to meet. Volunteers are on hand to offer support where necessary and to ensure the well being of those attending. In this way we can enable members to regain confidence and re-learn skills. Our support is available to carers too, although many take the opportunity to "do their own thing" whilst members are at the Club. Our volunteers are very experienced, which is not surprising as the Club has been running since 1987. Although we've worn out three vehicles we've not been so hard on our volunteers some of whom were involved in setting up the Club. The Club is managed by a Committee that brings together Club members and volunteers and they plan the activities that everyone enjoys. We frequently have excellent speakers and musical entertainment; but there also there are quizzes, refreshments, raffles and a sales table. And we all enjoy a chat don't we! The Club is proud to be one of the latest organisations in the Abergele area to be serving Fair Trade tea, coffee and sugar.